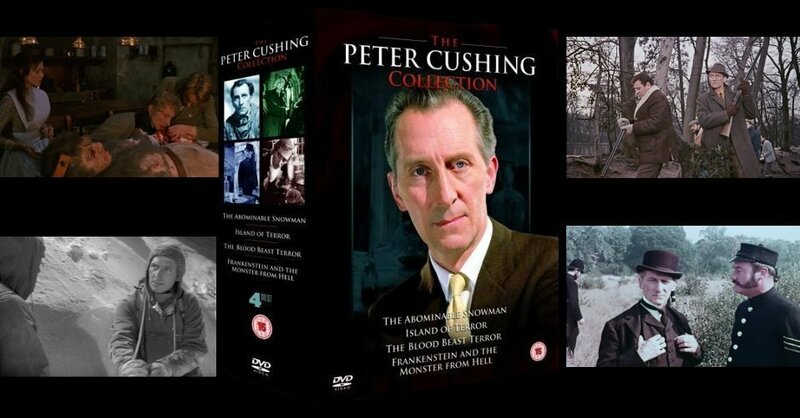 4 film, 4 disc collection of lesser known horror films from the mild mannered British star. DD-Video R2 UK boxset. Review of the Anolis German DVD. See end notes for comparison with the DDHE disc. Anyone famous in it? Alongside Peter Cushing, look out for Edward Judd, Robert Flemyng and Forrest Tucker. Fans of Cushing and Hammer Horror should enjoy this although they are not his best works. The picture quality is decent throughout. Island of Terror and The Blood Beast Terror are generally grainy and speckeled, but far superior to most VHS or public domain releases. Frankenstein and the Monster from Hell and The Abominable Snowman look much better. Extras All of the discs include original trailers, photo galleries and detailed 24 page booklets. There are additional features on each disc, see the reviews for more details. Other regions? Some films have releases in other countries. With the exception of Frankenstein... the DD-video discs presented here are the best available versions of these films. See the review of Frankenstein... for notes on the differences between this disc and the fully uncut German R2 DVD. Cuts? All films are believed to be fully uncut (see the Island of Terror and Frankenstein... notes). Prints are English language. A decent set of prints with a very fine collection of extra features. A couple of very brief cuts on two of the discs, although nothing particularly noticeable. A recommended way to see these films. All text in this review written by Timothy Young - October 2006.